For the novel by Yasunari Kawabata, see Thousand Cranes. For the children's historical novel by Eleanor Coerr, see Sadako and the Thousand Paper Cranes. One Thousand Origami Cranes (千羽鶴, Senbazuru) is a group of one thousand origami paper cranes (折鶴, orizuru) held together by strings. An ancient Japanese legend promises that anyone who folds a thousand origami cranes will be granted a wish by the gods. Some stories believe you are granted happiness and eternal good luck, instead of just one wish, such as long life or recovery from illness or injury. This makes them popular gifts for special friends and family. The crane in Japan is one of the mystical or holy creatures (others include the dragon and the tortoise) and is said to live for a thousand years: That is why 1000 cranes are made, one for each year. In some stories it is believed that the 1000 cranes must be completed within one year and they must all be made by the person who is to make the wish at the end. Eternal flame of peace, with cranes, in Ueno Tōshō-gū shrine, Tokyo, Japan. A thousand paper cranes are often given to a person who is often seriously ill, to wish for his/her recovery. They are often created by friends/colleagues as a collective effort. Another common use is for sport teams or athletes, wishing them victories. Cranes are a symbol of peace, and thus often seen at places like war memorials or atomic bomb memorials. Several temples, including some in Tokyo and Hiroshima, have eternal flames for world peace. At these temples, school groups or individuals often donate senbazuru to add to the prayer for peace. The cranes are left exposed to the elements, slowly dissolving and becoming tattered as the wish is released. In this way they are related to the prayer flags of India and Tibet. The Japanese space agency JAXA used folding 1000 cranes as one of the tests for its potential astronauts. The one thousand origami cranes were popularized through the story of Sadako Sasaki, a Japanese girl who was two years old when she was exposed to radiation from the atomic bombing of Hiroshima during World War II. Sasaki soon developed leukemia and, at age 12 after spending a significant amount of time in a hospital, began making origami cranes with the goal of making one thousand, inspired by the senbazuru legend. In a fictionalized version of the story as told in the book Sadako and the Thousand Paper Cranes, she folded only 644 before she became too weak to fold anymore, and died on 25 of October 1955; in her honor, her classmates felt empathy and agreed to complete the rest for her. 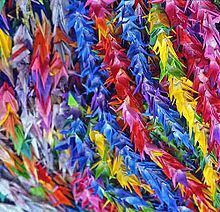 In the version of the story told by her family and classmates, the Hiroshima Peace Memorial Museum states that she did complete the 1,000 cranes and continued past that when her wish did not come true. There is a statue of Sadako holding a crane in Hiroshima Peace Park, and every year on Obon day, people leave cranes at the statue in memory of the departed spirits of their ancestors. Sets of origami paper are sold widely in Japan, with senbazuru sets including 1000 (or more, in case of mistakes) sheets of paper, string, and beads to place at the end of each string to stop the cranes from slipping off. Commonly the cranes are assembled as 25 strings of 40 cranes each. The size of the origami paper does not matter when assembling a thousand paper cranes, but smaller sheets consequently yield smaller and lighter strings of cranes. The most popular size for senbazuru is 7.5 by 7.5 centimetres (3.0 in × 3.0 in). Some people cut their own squares of paper from anything available, such as magazines, newspapers, notebooks, and printer paper. Origami paper used for senbazuru is usually of a solid color, though printed designs are available. Larger size origami paper, usually 6x6 inches, often has traditional Japanese or flower designs, reminiscent of kimono patterns. Wikimedia Commons has media related to Origami crane. This page was last edited on 3 April 2019, at 22:41 (UTC).